Last week’s launch of the first GPS Block IIF illustrates the changes that have occurred not only with the pioneering U.S. GNSS program but also with the nation’s aerospace industry since the Global Positioning System initiative was launched 36 years ago. These changes include the status and expectations placed on GPS by U.S. Air Force executives and the public, the shrinking base of space electronics suppliers and aerospace prime contractors, the growing technical complexity of the system, and Department of Defense (DoD) procurement and funding processes. The successful May 27 lift-off of the first IIF space vehicle (SV1) on the fourth attempt followed years of program delays. Launch postponements are not unusual for the first in a new series of satellites. IIF SV1 involved not only a new spacecraft, but also a new suite of ground support equipment (GSE) at the launch site and a new launch vehicle (the multi-purpose Delta IV, replacing the Delta II rockets specifically designed to carry GPS satellites into space since 1989). But the 14-year span between the IIF contract award in 1996 and first launch in 2010 is by far the longest in the GPS program’s history. The prototype GPS satellites, Block Is, were designed, built, and launched four years after the 1974 contact award to Rockwell. Block II and IIA followed with a Rockwell contract in 1983 for 28 satellites. First launch came six years later on February 14, 1989. Even adding in the two years it took Rockwell to convert the final Block 1 SV into a redesigned Block II qualification satellite only brings the contract/launch timeline to eight years. The next generation of spacecraft also required only eight years to bring into operation. GE Astro (later acquired by Lockheed) won the GPS IIR contract in 1989, and the first successful launch came eight years later in July 1997. The IIRs were actually ready to go before then, but earlier generations of GPS spacecraft were proving more durable than expected, and the Air Force had yet not launched all of the IIAs. 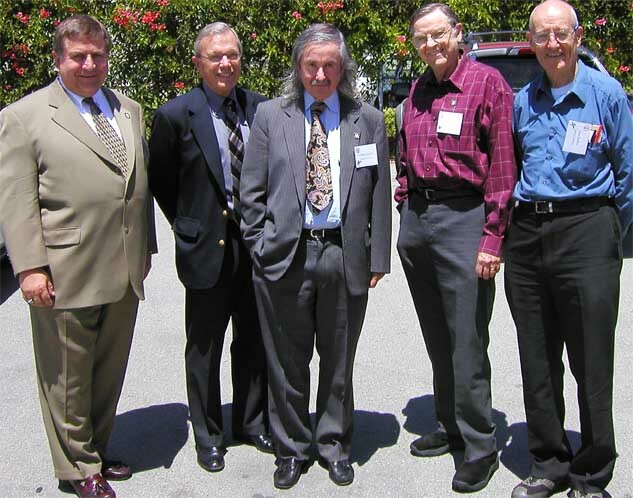 The first IIR launch actually occurred before the last of the Block IIAs went into space. The schedule for the GPS III satellites, under a contract won by Lockheed Martin in 2008, would restore the shorter timelines of the earlier blocks by putting the first SV into orbit within seven years — by 2015. 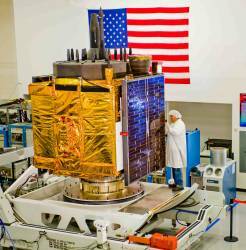 According to the GPS Wing and Lockheed, the GPS III program is actually running ahead of schedule. It took Odysseus 10 years to get back to Ithaca from the Trojan War, but the Air Force needed 14 before it could bring the IIF deal home. Fourteen years is a long time to keep an engineering team together, especially when the prospective order for 33 satellites shrinks to 12 and the company loses out on a subsequent round of bidding (in 2008 for GPS III). Consequently, Boeing’s engineering team overseeing IIF spacecraft construction and launch preparations does not include most of the people who designed, developed, and supervised manufacture and acquisition of the parts for the satellites. That’s hardly surprising for a program that stretched out more than a decade. But it means that Boeing is operating without much of the living, breathing, thinking institutional history that’s so useful when the inevitable glitches arise in producing an operational space vehicle. And there have been many of those. On September 9, 2007, Boeing announced that it had completed assembly of the first satellite in the Block IIF series. Technicians then began preparing IIF SV1 for dynamic environmental tests designed to confirm its structural design and mechanical integrity. They also attached the solar panels and configured the satellite in preparation for several physical tests. At that point, a series of technical problems arose that prevented the spacecraft from passing the tests. Discontinuance of products by suppliers and even disappearance of the companies themselves in mergers and acquisitions complicated replacement of flawed components. And the problems continue to arise with tests being produced on Boeing’s “pulse” line in El Segundo, California, where IIF SVs 2–4 are under construction. Of course, the IIFs are a much bigger, more complicated spacecraft than the first GPS satellites. The GPS Block Is had a design life of five years, and their navigation payload only needed to transmit three L-band navigation signals: civil C/A-code and military P-code at 1575.42 MHz (L1) and P-code at 1227.60 MHz (L2). They weighed 759 kilograms (1,673 pounds) and had a span of 5.30 meters (17.30 feet) at the solar panels, which supported an electrical system that required an average of 0.40 kilowatts. In comparison, the IIFs have a design life of 12.5 years, weigh 1,545 kilograms (3,406 pounds), and carry a span of 13.11 meters (43.01 feet) with solar panels producing an average of 2.40 kilowatts. The satellites’ navigation payload must generate and transmit seven signals: C/A-code and civil L2 (L2C), the legacy P(Y)-code and the new military M-code at L1 and L2, and a new civil safety-of-life signal at L5 (1176.45 MHz). The two new civil signals, L2C and L5, were added to the IIF specifications in 1998 after the basic IIF design had been set, requiring engineering changes and increased costs and time to completion. Added design complexity has contributed to the higher cost of later generations of GPS satellites. In 1974, Block I satellites cost $20 million each on an initial order of eight SVs. The price tag on the IIFs have reached an averaged of $121 million each. 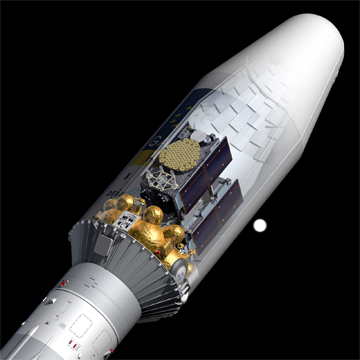 The initial three IIF SVs were acquired under a billion-dollar research, development, test, and evaluation contract, with the cost of the other nine approaching $60 million each. Taking the program expenditures altogether produces a total spacecraft expenditure of $1.452 billion. Further driving the cost was the Air Force’s decision to truncate the satellite buy substantially, thereby foregoing economies of scale. At the time that Rockwell Space Systems Division won the contract in 1996, if all options had been exercised, the contract had a potential value of about $1.3 billion for building 33 spacecraft through 2012 — at an average SV cost of $39.3 million. Boeing inherited the contract when it purchased Rockwell’s aerospace and defense businesses later in 1996. Over the next 10 years, the Air Force exercised the options in blocks of three — with the last order coming in 2006. A sea change in DoD acquisition philosophy and the subsequent reversion back to earlier practices didn’t help, either. The IIF contract was let under the now ritualistically maligned total system performance responsibility (TSPR) “acquisition reform” of the 1990s. TSPR handed responsibility for military contracts over to prime contractors, whom the Air Force expected to go away and produce the goods as specified within the designated timeframe. This reform allowed defense acquisition managers to downsize their own engineering staffs, who previously had closely monitored prime contractors’ progress on satellite development, often collocated at the primes’ facilities. In recent years, DoD has sought to go “back to basics” in procuring new systems and overseeing the execution of the associated development contracts. The GPS Wing responsible for implementing the contract increased its own engineering staff and their interaction with prime contractors and supporting engineers from The Aerospace Corporation, a federally funded research and development organization that works almost exclusively for the Space and Missile Systems Center at Los Angeles Air Force Base. The delays and changes of direction imposed on the IIF program allowed a lot of second-guessing by Air Force and Aerospace Corporation engineers, which continued up to the final days before the GPS Wing gave the final go-ahead to the project.